Home / Amazing / News / Viral / Isang Abandonadong Mall, Ang Pinagkakaguluahan Dahil Dito. Alamin Kung Paano Ito Nangyari. Isang Abandonadong Mall, Ang Pinagkakaguluahan Dahil Dito. Alamin Kung Paano Ito Nangyari. An abandoned shopping mall in Bangkok, Thailand has been a nuisance to the residents nearby because of all the mosquitos breeding inside the lot. The New World Mall was built a number of years ago but unfortunately, it has not been used since this shopping center did not have the required building safety regulations. In 1999, a fire destroyed the interior of the mall, including the roof, which made the building vulnerable to anything. People did not bother to fix the building anymore so this resulted to nature claiming the complex. It was later left to rot. A few plants grew on the walls as well as on the floors. Rainwater found in the basement was collected from all the heavy downpour through the years. This was the cause of the mosquito problem which residents in the area found to be problematic. To solve the problem, a few locals threw in a number of fishes to take care of the insects. Inside this big looking pond is a number of different marine species such as tilapia, catfish, koi fish, mango fish, goldfish, and silver fish. These fishes multiplied, which became a big help in taking the insect invasion under control. Now the residents and merchants are in peace. The sellers’ businesses around the mall has improved ever since the mall became a tourist spot. 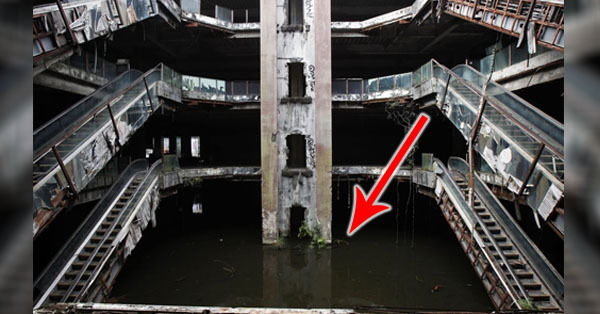 Who would not be impressed to see an abandoned shopping mall that now looks like a big pond—with escalators and chairs? Ever since the news broke about this abandoned New World Mall, tourists have been visiting the area for its unique and amazing site. Watch the video below to see the entire mall! What do you think about this abandoned shopping mall with hundreds of fishes? Would you like to see it for yourself too? Do share this story with your family and friends! Go on and tell us your thoughts as well in the comments section below!